A few weeks ago I received a request: to show some "man food" on KLB. To me, Man Food is rare steaks and giant hunks of grilled meat, juicy burgers and also maybe the kind of food you might eat when you're camping. How the hell could I make authentic pure vegetarian Man Food? I can do great things with seitan; but let's face it, no one truly wants a hunk of rare seitan steak. 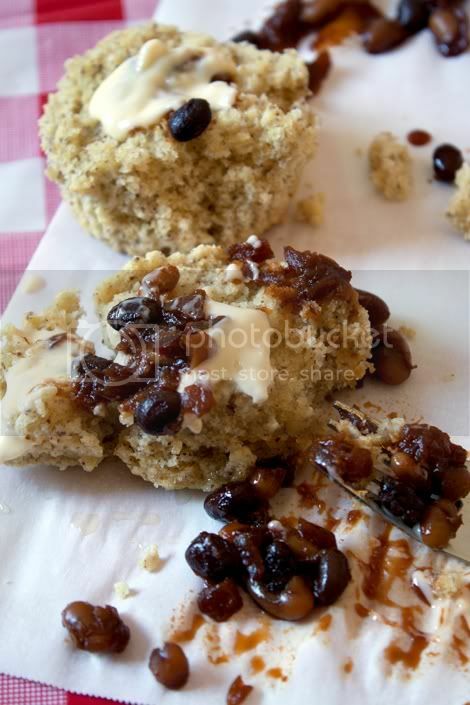 But for those manly omnivores who are open to trying the pure veg way, I sort of figured that mixing bourbon and beans, and sweet corn muffins slathered with Earth Balance buttery spread would do the trick. Of course once it was time to taste the recipes, the natural thing to do was fork the sweet, smoky, spicy, hearty Bourbon Baked Beans onto the corn muffins (a veganized version of a Barefoot Contessa recipe). And? I'm still eating — I only wish I'd doubled both recipes. Have a great weekend and don't forget to check back early in the coming week for the Sweet Corn Muffins recipe. The beans in all their glory will come later.